Johan Cruyff, Marco van Basten, Ronald Koeman, Dennis Bergkamp, Edgar Davids -- by no means an exhaustive list, but a snapshot of a regal lineage. Matthijs de Ligt is the latest -- not so much a cab off the rank as a Rolls Royce. He might just be the ultimate product of his environment. A 19-year-old captain of the 33-time Eredivisie champions; an Ajax boy from the age of nine; a starter against Manchester United in the 2017 Europa League Final -- the youngest player ever to feature in a European decider. When he leads his side out to take on Real Madrid in next week's Champions League last-16 tie, he will do so as the second youngest skipper in the competition's history. Only Ruben Neves -- then of Porto -- was younger. 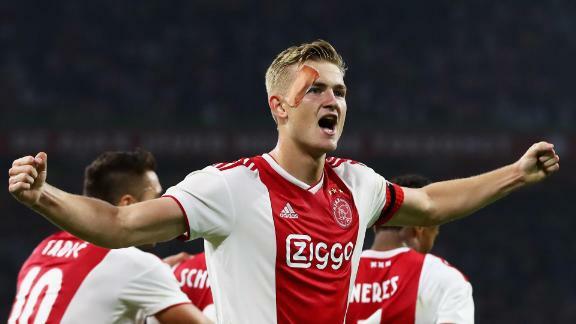 Fittingly, when De Ligt made his Champions League bow in a 1-1 draw with Bayern Munich earlier this season, he surpassed Rafael van der Vaart -- another graduate of Jong Ajax's famed conveyor belt -- as the competition's second-youngest captain. To look at this as a coincidence is to ignore generations of tradition, generations of careful nurturing. Quite simply, De Ligt tells CNN: "The most important thing is that they want to develop you." Ajax exists almost without parallel. And as De Ligt speaks, he does so with the self-assured confidence of a young man raised and developed in the club's distinct manner. Immensely popular among Amsterdam's adoring football public, he is one of their own in a way that few beyond the city could begin to understand. "It's really nice," he says, of the relationship with the club's supporters. "I was a fan before when I was younger, so I watched a lot of games and I was always singing in the crowd and shouting when the referee made a mistake or something, you know? "And now to play in the arena, to be captain of this team is something else, a dream." It is, of course, an arena adorned with Cruyff's name -- the icon whose influence is etched all over the club. Cruyff won the European Cup with Ajax three times in succession in 1971, '72 and '73, before collecting a wide array of titles with Barcelona and Feyenoord, and the Dutchman is widely regarded as one of the greatest players of all time. "Everybody knows Johan Cruyff," De Ligt says. "And everybody knows the impact he had on the football world and on Amsterdam. "The city breathes football, and I think that's what you see in those games for us. A lot of tension, a lot of shouting and noise. It's really incredible." They are the words of a natural leader, albeit one who was still four years from birth when Patrick Kluivert scored to clinch Ajax's most recent European crown in 1995. The notion that age is but a number, perhaps, rings true nowhere more than at a club spearheaded by this impressive teenager. "Of course it's an extra responsibility being captain of a club like Ajax," he says. There is no cliché, but a relaxed professionalism that stretches across his words. "It's always a big moment. But for me, it's nothing new. In the youth [teams], I was a captain before, so I know what responsibility is, and I like responsibility. I like the challenge of developing into a good captain and becoming a better captain. "I dreamed of becoming Ajax captain, but more like at the age of 24 or 25, to be honest. That it came so soon is really special." Of course, that it came so soon is a consequence of the culture at one of European football's historic heavyweights. "If you are the best in your own age, they move you to a higher group," he explains. "It's more difficult for you to adapt there and it makes your development faster. And that's the most important thing, I think." The tutelage of a number of former Ajax greats also helps the Dutch club's production line to keep rolling. "In the Under-19s you have Winston Bogarde, who played for Barcelona, Milan, and Chelsea," adds De Ligt. "At Jong Ajax, we had Jaap Stam -- one of the best players in the world. In the first team, you had Frank de Boer. For a young player it's really nice to get trained and to learn from those guys." De Ligt's story gives him a rare authority on the subject. It was only when he turned 15 that he dropped back from midfield into the center of defence. He has, in a sense, completed the pathway in double-quick time. One might even view him as the model graduate of a model academy. When the Rio Olympics got under way, De Ligt had never even represented the club's reserve team. "You have to dream to become a footballer," he says. "Most of the people don't like school that much when they're younger. So, you had to be pushed to go to school, and I think it's really good that Ajax gives you the ability to get some lessons here, to learn here and become a better football player, but also a better person and more intelligent person. That's also important." His footballing skills allied to a poise beyond his years make it hardly surprising he has been linked with a plethora of Europe's top clubs. The nature of European football's financial food chain means that -- as per De Jong -- De Ligt's future may well lie away from Amsterdam. The captain, however, is giving nothing away. "You never know," he admits of his long-term destination. "At the moment, I'm really happy at Ajax. Every day I come to the club with a smile on my face. So, I'm really happy here, and at the moment I'm not focusing on other clubs. "I'm just focusing on becoming champion with Ajax, winning the cup and winning against Real Madrid. "They have won the Champions League three times in a row now, so of course they are the favorites. But we know our strengths. We know what we can do, and we will see where it ends, and we have a lot of confidence. "It's also going to be difficult, but it's a challenge and that's the only thing I think about."